MicroRNAs (miRNAs) are small endogenous noncoding RNA molecules that posttranscriptionally regulate gene expression. Since their discovery, a huge number of miRNAs have been identified in a wide range of species. Through binding to the 3′ UTR of mRNA, miRNA can block translation or stimulate degradation of the targeted mRNA, thus affecting nearly all biological processes. 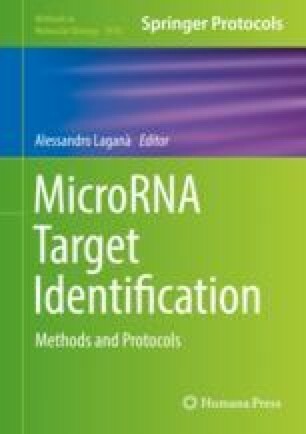 Prediction and identification of miRNA target genes is crucial toward understanding the biology of miRNAs. Currently, a number of sophisticated bioinformatics approaches are available to perform effective prediction of miRNA target sites. In this chapter, we present the major features that most algorithms take into account to efficiently predict miRNA target: seed match, free energy, conservation, target site accessibility, and contribution of multiple binding sites. We also give an overview of the frequently used bioinformatics tools for miRNA target prediction. Understanding the basis of these prediction methodologies may help users to better select the appropriate tools and analyze their output.